At the heart of any good business is a timely and accurate accounting system. This is because accountancy is the language of business. If you don’t have a good accounting system then you are trying to steer your ship, in heavy seas, in a dense fog, absent a map or a compass. Good accounting records also mean your business pays the correct amount of GST and income tax. This means you don’t end up ‘overboard and eaten alive by the Tax office’ because you were unable to prove your tax position. Your tax position that the ATO or a Judge is unlikely to believe unless you have proof. What better proof can you provide other than the records of an independent registered Chartered Accountancy Firm such as Antony Syndicate? At Antony Syndicate we specialise in running the accountancy back office of a majority of our clients, including businesses, superannuation funds, not-for-profits and sporting clubs. We undertake our book keeping services using the latest MYOB systems. We can work on or off the ‘cloud’. Our team is efficient and accurate. Unlike a large number of book keepers we prepare the accounting and tax records properly. This means all taxation and reporting matters are automatically ready for your review and action – and of course ready for our expert tax agent input. With one-touch payroll upon your doorstep it is prudent to start planning now. Talk to us about what you need and what you can afford. You may well be surprised as to just how much value you can generate for your business by placing your book keeping and accountancy in our hands. 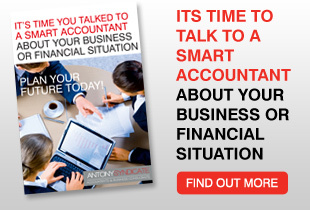 Now is the time to call Antony Syndicate on 02 9648 6880 for Bookkeeping & Account Oursourcing services tailored to your unique needs.Our fees are both affordable and realistic.